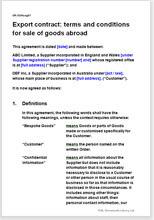 An export sales agreement that can be used to sell any type of goods to any country overseas. It can also form the basis of a terms and conditions document to be given to prospective customers with quotations or advertising material. The agreement gives a full choice of all 11 current (2010) Incoterms understood by importers globally. This is a comprehensive set of terms and conditions for export sales, for a business selling any type of goods to another business in another country. It aims to give an advantage to the supplier-exporter. The document is structured as an agreement (that both parties sign), allowing you to negotiate the terms of every transaction with your customer. While it is common to publicise the main terms and conditions of export on advertising materials as being on a "take it or leave it" basis, with this document, you can also vary the terms on an individual customer or shipment basis. Of course, there is nothing to prevent you from using the content of this agreement to create standard T&Cs for your brochures or quotations either. The export agreement gives a full choice of all 11 current International Commercial Terms (known as Incoterms), a full description of each (so that you can make a decision as to which is best for you). We also provide alternatives if you would prefer to use your own. We have included many alternative provisions in the agreement for you to select the deal you want in a way that secures payment by your customer as far as possible. The agreement provides for you to be the party who fixes the terms: such as the date the contract comes into existence, retention of title or returns policy. The law concerning export tends to relate to the goods being shipped (customs and duties) rather than the sales agreement. This export contract is common law, which has two benefits. Firstly, you are free to choose the deal you like. The export agreement follows the basic law of contract covering: price, offer, acceptance, delivery, shipping, acceptance of goods, complaints, and returns. You can vary the terms of any of these to suit you or your customer. Secondly, common law is used across the Commonwealth and understood in nearly all countries. As drawn, this export contract leaves the supplier to cover statutory requirements at home and the customer to cover them at his end. Suitable for any types of goods. "Used for business and personal documents - good service; in fact .... Great Service!" "Try the forms from this site because we have found them up to date and relevant."